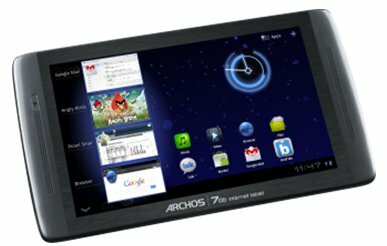 Archos introduces the 70b, a new Android 3.2 "Honeycomb" tablet that will be available by mid-January 2012 for 199EUR (including VAT). ARCHOS, an award-winning innovator in consumer electronics, announced today the upcoming availability of the first Android* 3.2 ‘’Honeycomb’’ tablet under € 200, the ARCHOS 70b internet tablet. The new ARCHOS 70b IT is an enhanced version of the ARCHOS 70 IT Gen 8 that features an upgraded capacitive touch screen and a powerful processor at 1.2 GHz. The ARCHOS 70b internet tablet runs Android 3.2 Honeycomb, Google’s full suite of mobile applications with Android MarketTM, giving users access to over 300,000 applications such as games, books, social media and news. With Honeycomb, users will benefit faster and smoother transitions between different applications, more intuitive navigation to and from home screens. This connected mobile device with a sublime user interface, 3D Graphics accelerator and Wi-Fi connectivity, comes also with a full pack of connected apps such as a web browser and email application, HDMI output and Micro SD connectivity.